According to the national park service, the Rae Lakes Loop is one of the most popular hikes in Sequoia and Kings Canyon, if not the entire Sierra. I completed the famous loop in 12 hours, 31 minutes, starting at 5:30 am and finishing just after 6 pm. The loop is 46 miles long and climbs from 5,035 ft at the trailhead to 11,978 ft at Glen Pass. 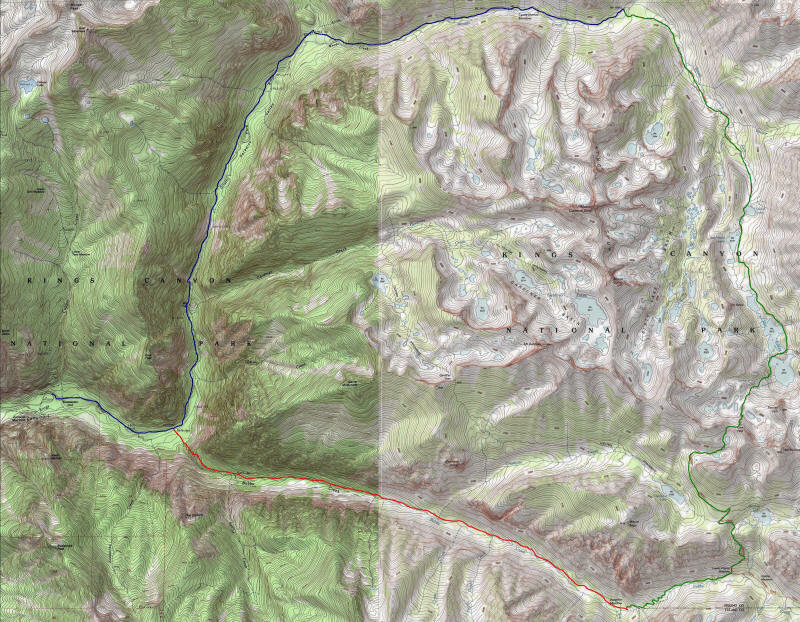 The portion between Vidette Meadows (Mile 14) and Woods Creek Crossing (Mile 29) is along the John Muir Trail. The highlight of the loop is the Rae Lakes area, a chain of large alpine lakes over 10,500 feet with views of rugged Sierra peaks. The trailhead is at Road’s End in magnificent Kings Canyon and travels along Bubbs Creek and Woods Creek, including Vidette Meadows, Castle Domes, and Paradise Valley. Most backpackers do the loop clockwise, which makes sense as you gradually gain elevation through the Rae Lakes basin. However, for running it makes more sense to go counterclockwise reaching the highpoint at Glen Pass in 18.5 miles, followed by 27.5 miles of downhill, in theory (there are lots of blips). Complete trip report with many photos and splits here or on Cascade Climbers. Map here. This entry was posted on October 28, 2009 at 10:53 am and is filed under Trip Report. You can follow any responses to this entry through the RSS 2.0 feed. You can leave a response, or trackback from your own site. That’s remarkably late for the High Sierra! Good of you to squeeze one more in. You’re ticking all the classics. No more of that here in Colorado; the hills above Boulder got 30″ of snow since last night. Very nice ! I made a moutain run in sierra nevada last may, 45 miles average too. It was incredible! I would be interested to have your GPS track. Is it possible ? Thanks!